Check out our Menu in Engish which offers foods that are delicately married into the American tastes. If you are 'brave' enough to try the authentic foods that Chinese people actually eat, check out the Menu in Chinese. Have you ever tried any Thai and Vietnamese foods before? Find out our amazingly delicious Thai and Vietamese foods and beverages in our Thai and Vietname Pho menu. 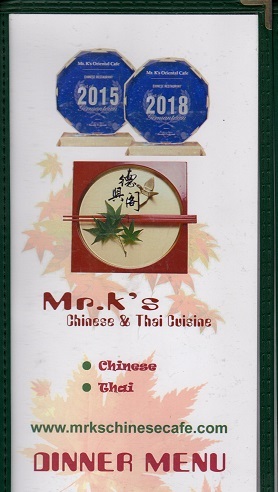 For your convenience, we have a downloadable menu for take-out or delivery. The menu is in English and Spanish. 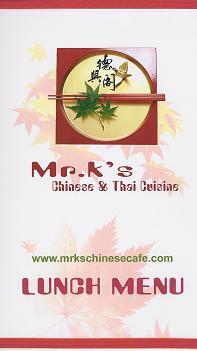 Whatever your dining choices are, enjoy the delicacies from Mr. K's Chinese Cafe!